Kevin Durant and the Golden State Warriors yawned through their win in Wednesday’s season opener against the Thunder. 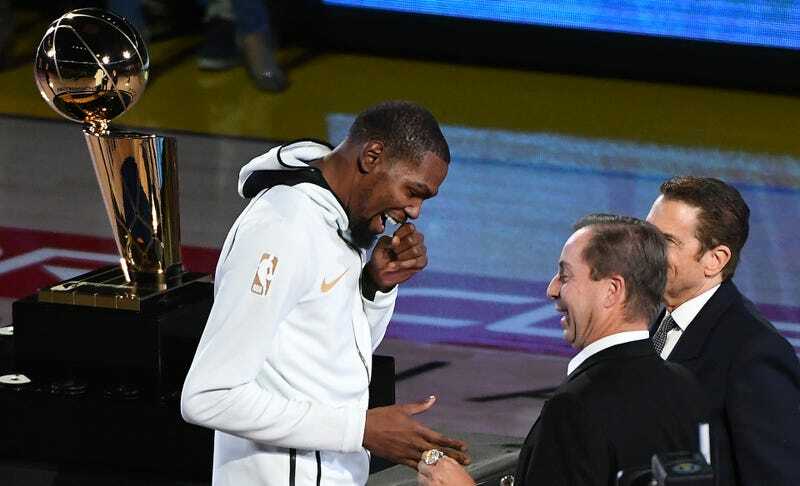 Durant had 27 points, eight boards, and six assists, and he seemed to have a nice, chill time playing with his buddies after everyone received their championship rings. Fittingly, he celebrated with a post about the night. Sourced-up Warriors reporters have opined that Durant, a free agent this summer, will leave town after the Warriors inevitably win their third straight championship (it would be their fifth straight, but, you know). Tony’s Instagram comment is a bit cryptic. Kevin, who has two titles, would need three more rings to fill up his hand, although one could argue that he’ll only need two more because, come on, who wears a ring on their thumb? Also, if he wins one more, then he’d fill the middle part of his hand up pretty well, and Tony never said anything about how full “the hand” would have to be, so this is a definite sign that Durant is leaving the Warriors to sign with the Knicks this offseason. Welcome to New York! Well, it’s settled: Tony Durant doesn’t exist, and this is yet another account operated by KD.